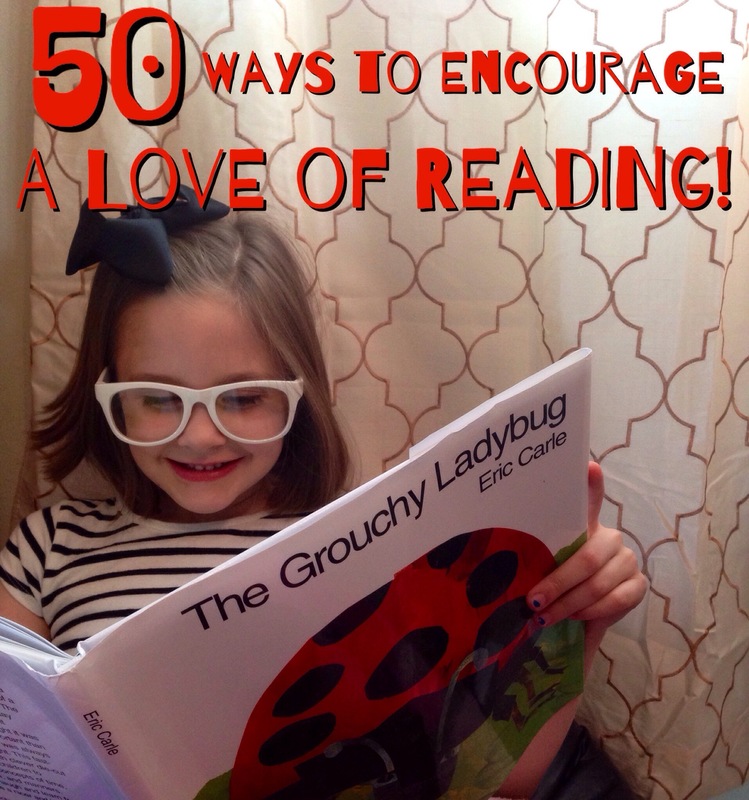 50 Ways to Encourage a Love of Reading | My Crazy Blessed Life! 3. Read to them daily. 4. While reading stop to talk about the characters, or a plot twist, or even just a silly concept to giggle about together. 5. Discuss the story when you’ve finished a book. 8. Have younger children point out letters they recognize and a bit older children words that they recognize or can read. 9. Stop to discuss words they don’t understand, helping them build their vocabulary builds their reading/comprehending confidence. 10. Have lots of books at home for them to look at and read with you. 11. Let them bring books in the car or wherever you are going. I let my daughter pick a book or two to take to the doctor’s office today. 12. Let children see you reading for pleasure. 14. Encourage them to tell you a story. Help them write it on several pages for them to illustrate then staple together for their first book! 15. Subscribe to a kids magazine and read it together. 16. Have a bookshelf in their room with their favorites and a few extra. 17. Download an early reading app on your phone or tablet. 18. Sing the alphabet song… then sing it again (in silly voices is fun too) repetition is how kids learn! 19. Create a quiet, comfy reading nook in your house. We have a bean bag with a pillow in a corner, and each kid brings their favorite blanket to snuggle up to read their book. 20. Encourage and celebrate their reading milestones! When they start really getting sight words, praise their effort. Kind words go a long way for kiddos. 21. Read them fairy tales and nursery rhymes. 22. Read them a book then draw a picture describing the story. I love seeing the story through their eyes! 25. Look for books that are about things they are already interested in. 26. Let older siblings read to younger ones. 27. One of my favorites, teach them about bookmarks! I love to get a longer story and split it up into a few days or nights. I choose particularly page turning moments to stop and stick in that bookmark. Leaving them begging for the rest of the story! Let their imaginations work it over until next reading time. 28. Encourage reading street signs, menus, labels, etc. Show them that reading is a wonderful source of information about their world. 29. Check your local library for a story time for little ones. 30. Chart their reading for the month. Let them have a chart with check marks or stickers for each book they read or you read to them. 31. Set aside time for reading. 32. Play games or do crafts that correspond to a book! We read Bartholomew and the Oobleck by Dr. Suess and then made Oobleck to play with! 32. Let them join a book club! Even at 5 & 6 my girls joined a book club and loved it 🙂 ask around to parents with kids the same age. Maybe start one! 33. Pause and ask the what they think happens next before turning the page to find out. Stretch those critical thinking skills. 34. Play dress up as your favorite book character! We do this in our homeschooling community for special days, my kids love it. 35. Let them make their own special bookmarks and laminate them for them. 36. Meet a librarian. Just ask at your local library. Meeting other adults who are enthusiastic about reading is a great way to encourage enthusiasm for reading in your little one. 37. Look for transition books to read together. When your child is potty training… there are books to go with that life stage. When your child is going to school for the first time… there are books about that. When your child is afraid of the dark… there are books out there to help them. Oh and on and on I could go… but I won’t. Whatever is relevant to them right now, look for a book about it. 38. Sing rhyming songs together. 39. Play games with letters or words. Like I pay the letter “c” let them search for where you see it. Or on a page with the same word over and over ask them to help you count how many times they see that word. 40. Use puppets to act out a story you read earlier. 42. Give children time to look through the pictures and discover. 44. Use your finger under the words you are reading as you read them. It encourages early readers to follow along and begin to understand reading right to left. 45. Stay enthusiastic! If you huff and puff and read in a monotone as fast as you can to just get through it again, trust me your child knows. If you want them to be excited about reading model that for them in your behavior towards reading. 46. Keep books in the car. 47. Let them help you with lists like while grocery shopping. Give them a pencil or crayon to cross items off the list. You may be reading it to them and pointing to the words to cross off but this reinforces reading too! 48. Have weekly or daily family reading times. Maybe even take turns reading parts of the story. 49. Try letting them read in new spots. Like outside, in a blanket tent, etc. 50. Listen to books on tape (CD yes I’m a child of the 80s and still say tape). Encouraging the love of a story.